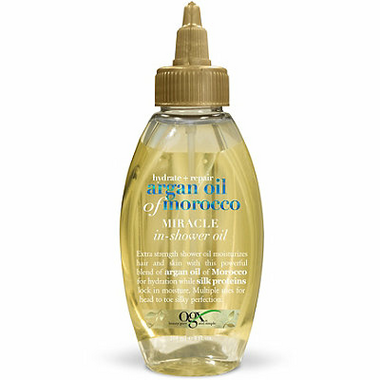 OGX Argan Oil of Morocco Miracle In-Shower Oil is an extra strength shower oil that moisturizes hair and shin. It features a powerful blend of argan oil of Morocco for hydration while silk proteins lock in moisture. Additionally, this oil has multiple uses for head to toe silky perfection. I love this stuff!! I add it to my conditioner in the shower and it really makes my hair manageable and shiny.